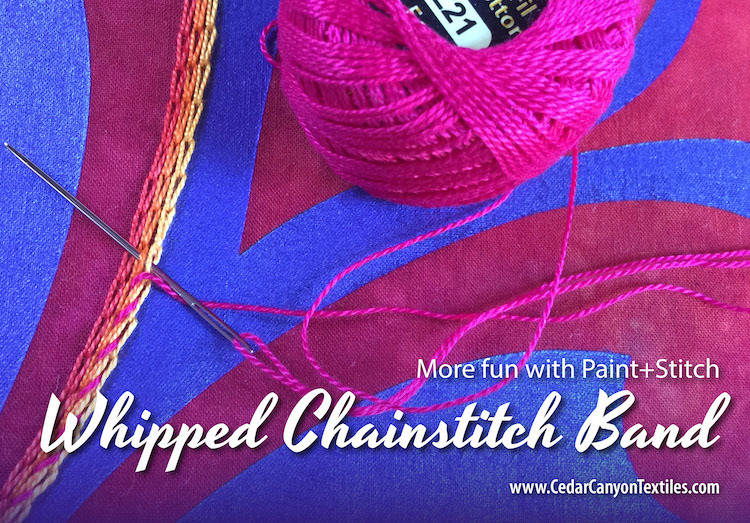 Try a Whipped Chainstitch Band for a Bold Swath of Color! I’ve been working on the next piece in my StarFlower series, and I was looking for a new and different way to create a heavy band along the edge of a shape. After some trial and error, I settled on a Whipped Chainstitch Band. A Whipped Chain Stitch Band starts with multiple rows of Chainstitch worked right next to each other. 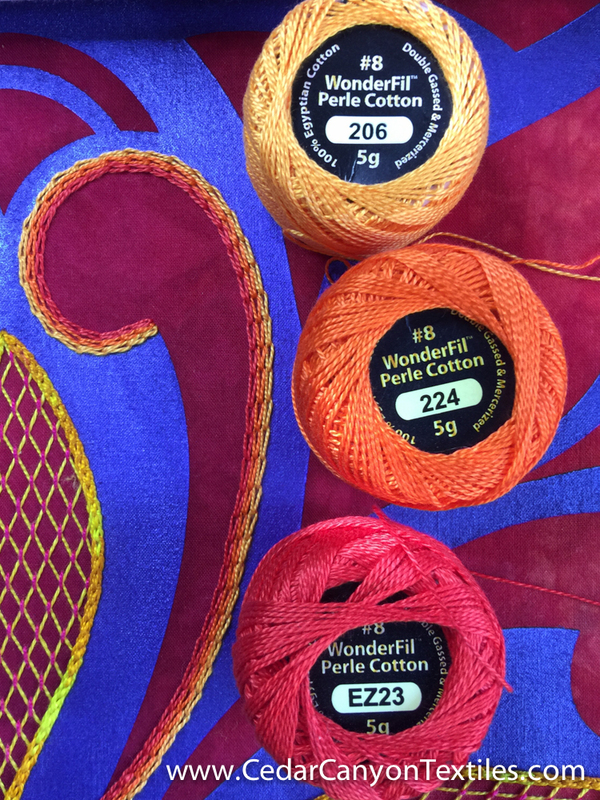 For this project, I chose 3 colors from my collection of #Wonderfil Perle Cotton solids. (Yes, I have the entire collection of size 8 colors!) I love this collection for the vibrant colors. Whipping the stitches together is pretty simple. In this photo, I’m whipping the right-hand loop of chain 2 to the left-hand loop of chain 3. To make things as simple as possible, I used a tapestry needle with a blunt point. As usual, I had to try this out with more than one thread. My first choice was to use Laura Wasilowski’s Sunrise variegated thread. I wasn’t sure I liked the way everything blended together, so I decided to try again. My next choice was a bright fuchsia from the Wonderfil line. In my mind, the fuchsia thread should have stood out like a sore thumb. In reality, it blended far too well with the red-orange inner band and the background fabric. Oops! I guess that’s why we do the test! One more round of stitching complete! With a clear choice of colors in hand, I completed the next round of stitching. 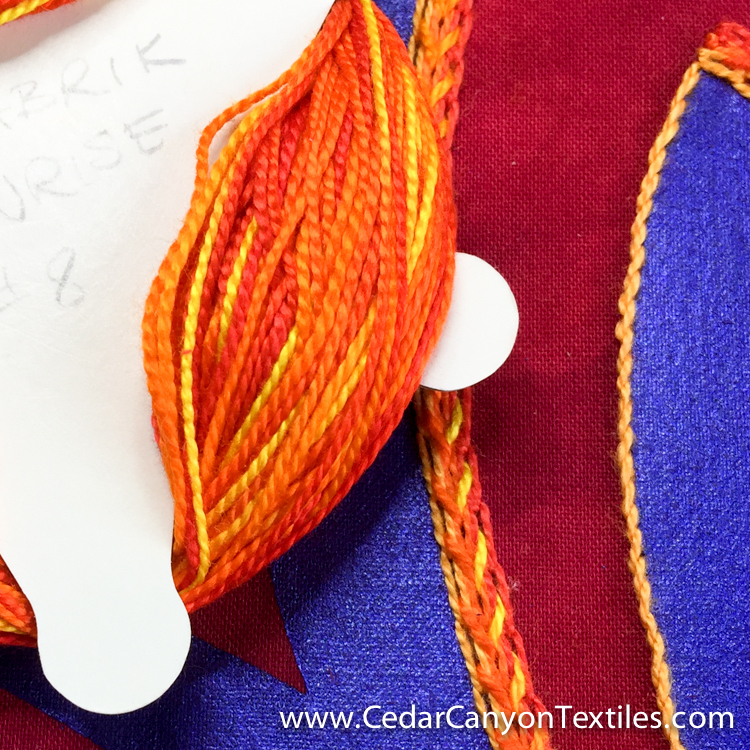 I’m happy to report that the Whipped Chainstitch Bands gave me exactly the look I wanted – a bold band of color with just enough variation to draw you in for a closer look. I got the idea for this type of band when I was reading Mary Corbet’s Lattice Jumble Sampler Guide. In that project, Mary used a band of 5 chain stitches with several different “whipping” options. The Guide is mostly about options for Lattice Work, but it’s chock-full of other goodies if you take the time to read through it. 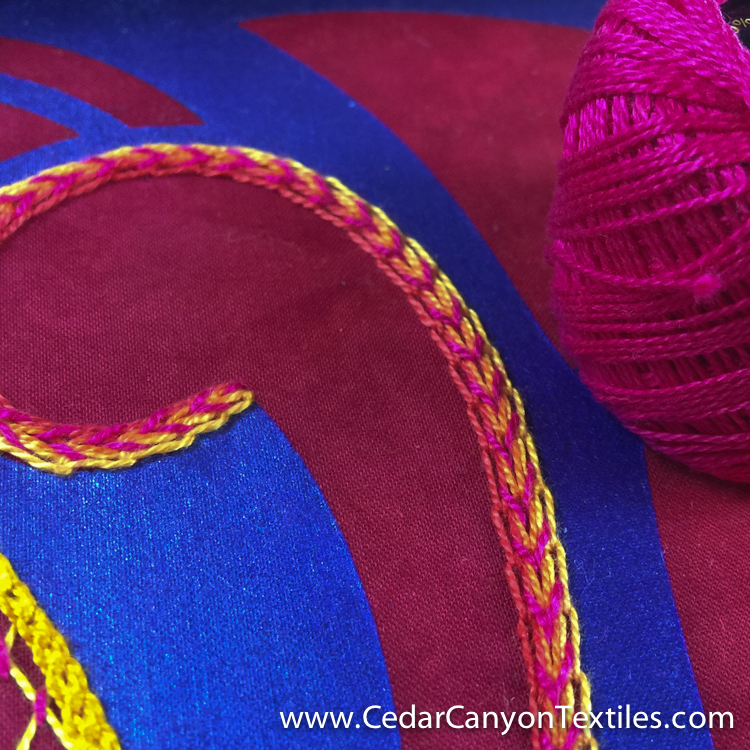 As alway, leave a comment below with questions or ideas about how you would create a wide embroidered band. I love to hear what you’re thinking about! I was also thinking of Laura Wasilowski’s variegated thread. Glad thought of it also. I am just about to start a stitch project too. My problem is there are simply so many beautiful stitches that I can’t decide where to start! Your doing wonderful work! Thank you for sharing. Hi Shelley, I was just thinking about you recently. I am glad your sabbatical is providing you with creative nourishment. Your recent work is gorgeous! Perfect timing on the whipped chain stitch band. 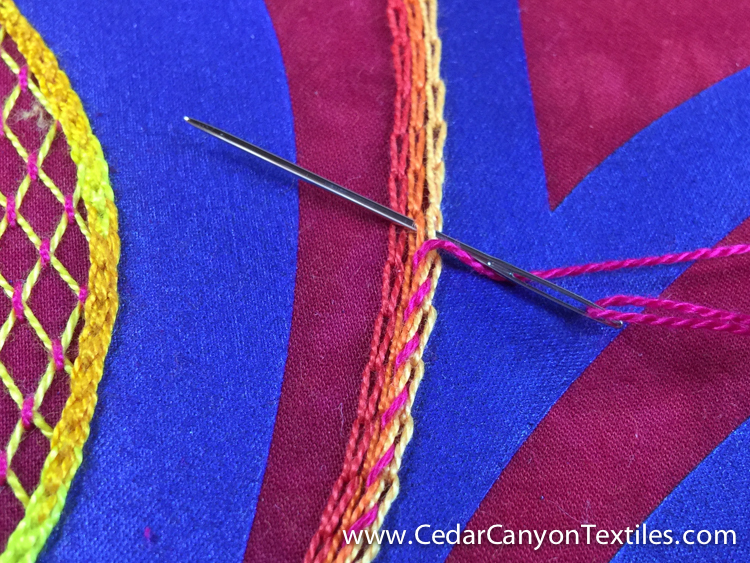 There is a focal flower on the piece I’m working on and it needs a heavier border stitch to draw attention to it. I was wondering what I would do. Know I know! Also, just thought about you yesterday and figured you were having such a great time doing what you felt like doing, that posts and newsletters weren’t at the top of the list. Good for you!! During my stays in Mexico, I came to know it as manana time . . . the very best kind of time! Mañana time is a good description, Marlene. Tomorrow, tomorrow, tomorrow. Have fun with the Chainstitch band. It’s a good one for your stitching toolbox. Your Whipped Chain Stitch embellishment is lovely! into your new home, south of the border! Thanks, Elizabeth. It will be a busy few months, but well worth the effort. I hope to be totally settled here in another 6 months. And sooner would be just fine with me! Hello Shelly, Wow these are glorious! 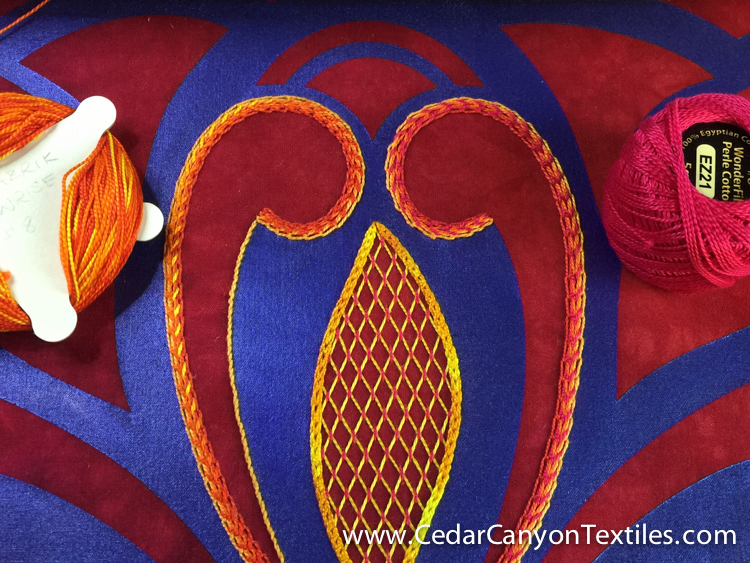 You have such wonderful embroidery stitching! I am very impressed. I am glad that you are having fun. I was thinking of you just the other day. Well hello to you too! I’m glad you enjoy the stitching pics. 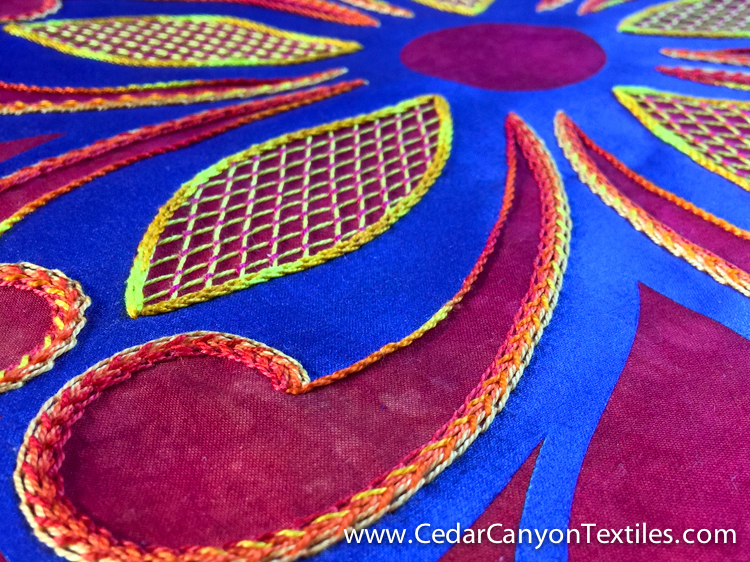 You can definitely use Paintstiks on satin and brocade, regardless of the content. Paint is paint and it will adhere to any fabric. 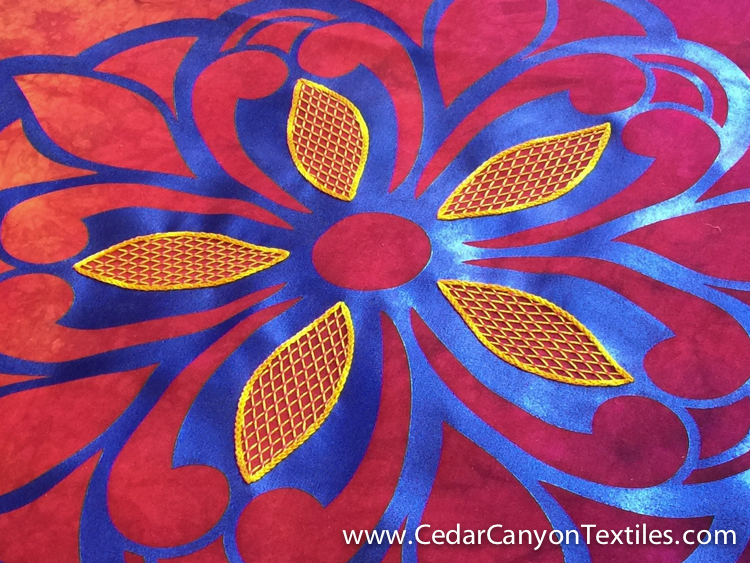 You asked a great question about the paints: One thing to consider is whether you want to use shiny paint on shiny fabric. You don’t get the same contrast as putting shiny paint on a matte fabric. Do a few tests and see what you think before jumping into the big banner. Use your Silhouette to cut a scale model of your design. That’s a great way to see the actual design on your chosen fabric before starting on the full size project. Wow, I had not thought of that. Thanks for pointing this out. I will do a mock up and see what I think. Thankyou!